There can be little doubt that social media platforms have entered our lives and irrevocably changed how we do things. For instance, the simple hashtag. A quick look at any Instagram timeline will reveal that the categorisation of photographic media has expanded beyond the simple caption. The popularity of the hashtag means that users not only describe their photographs but the atmosphere and context in which they are captured, for example #coffee is easily followed by #friends or #studyfuel. As a result, hashtags are already more powerful than the traditional caption in data terms. Yet despite this power the hashtag comes under criticism as no more than a destructive millennial fad used to propagate vanity and self-obsession. While it is true that the application of these tags can often be trivial it is also true that they hold real power, power that could easily expand beyond the typical newspaper and could ignite political awareness in what can be described as a politically apathetic but increasingly connected generation. The real advantage of hashtags is their simplicity. The short structure of an essentially one or two word medium allows for quick, identifiable quantification which can be harnessed to rapidly and successfully build or consolidate a movement. This easy and simplistic identification facilitates the immediate construction of a narrative, a narrative which can be dispersed with little effort yet spread like wildfire. The power of these narrative is to counter more traditional forms of mass media within minutes, with little effort and at little cost. In his study of mainstream media versus alternative online media coverage of the TEKEL workers protest against privatization in Turkey, Burak Doğu notes that alternative media flourishes when mainstream media fails to represent important facets of social and political reality (Doğu 631). The aim of this media flourish is to raise public awareness. The challenge for this new media however is to make their presence known and, in order to achieve this, a campaign must rely on memorable categorisation in an ever changing platform.A campaign must make their media stand out through data categorisation so that they can compete with the popular competitors such as #selfie #tbt and #food. Similarly, the beauty of this quick categorisation is its multi-functional capacity across various platforms. As well as becoming an everyday form of communication over text and Snapchat #hashtags are recognised as data containers across Instagram, Facebook and Twitter. This multi-platform engagement, therefore, facilitates a media empire that requires relatively little beyond a public or private computer and a data connection. #everydayafrica is a wonderful example of simple data categorisation which has been used to huge success as a base for a counter-narrative to traditional mainstream media. Photographer Peter DiCampo and writer Austin Merrill began the project in 2012 in order to combat the cliché images of war, poverty and death that dominate media coverage of Africa (Teicher AmericanPhoto). Initially a tumblr product the movement reached booming success following its transfer to Instagram and has inspired several “Everyday” accounts embodying a similar perspective in different locals around the world. In conclusion, hashtags may be divisive, a concept of mockery among some and a revered art among others, but there is no doubting the simple tag’s ability to construct a debate. Of course this depends upon application but if we can divide newspapers in tabloid and broadsheets why can’t we apply this same categorisation to Instagram or Twitter? Why can’t we acknowledge the power of #selfie? Biddle, Sam, ‘How the Hashtag Is Ruining the English Language’ Gizmodo http://gizmodo.com/5869538/how-the-hashtag-is-ruining-the-english-language. Web. 01 December 2016. Chan, Casey, ‘Justin Timberlake Shows Us How Dumb We Sound When We Use Hashtags’ Gizmodo http://gizmodo.com/justin-timberlake-show-us-how-dumb-we-sound-when-we-use-1382465357. Web. 01 December 2016. Doğu, Burak, ‘Comparing Online Alternative and Mainstream Media in Turkey: Coverage of the TEKEL Workers Protest Against Privatization’ International Journal of Communication, 9: 2015. Web. 630–651. 01 December 2016. Reznik, Eugene, ‘Taking a walk with Ruddy Roye, Instagram Activist’ AmericanPhoto http://www.americanphotomag.com/taking-walk-ruddy-roye-instagram-activist. Web. 01 December 2016. Teicher, Jordan G, ‘How Instagram Changed Street Photography’ AmericanPhoto http://www.americanphotomag.com/how-instagram-changed-street-photography. Web. 01 December 2016. The Importance of Metadata Standards: Why bother? Before explaining why standardised metadata is important it is firstly important to understand what metadata is. Essentially metadata is ‘data about data’. We use metadata to describe other objects, for instance, when you open a book and see the author, publisher, contents, etc., you are looking at a book’s metadata. For digital preservation purposes standardised systems are created to record these features so that an easily searchable and detailed record are created. As Adam Rabinowitz exhibits when we accurately create and store this data we can prevent the ‘flattening process’ which compresses our history into thematic periodisation (Rabinowitz). So why not do it? 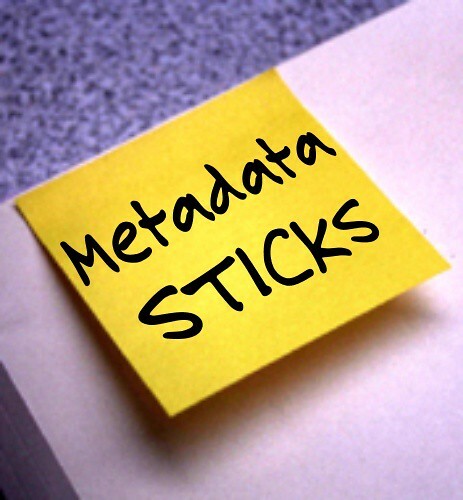 The concept of metadata seems relatively straightforward yet there are dozens of articles, across numerous disciplines, outlining how to put it to best practice and why this practice is important (Linkert, Park, Riley). This abundance of guidelines and information can only result from a resistance among the academic community to implement a strong metadata policy into their research. Perhaps the number one factor motivating this resistance is simply time consumption. Creating and fulfilling metadata standards is a time consuming process, which requires added thought and labour. As shown by Paul Edwards et al. adding metadata to a project can increase the workload significantly (Edwards 673). So the necessary question to ask really is why this extra workload is worth your time and effort? There are many advantages to creating good, in depth standardised metadata forms. Each on their own could supply content to fill a journal. Simply put, yes standardised metadata requires a longer research period to begin with, but, in the end it promotes better research. This research is not only more beneficial and expedient for researches that follow but provides high quality data that results in efficient research and findings rooted in solid evidence (Corti). As in the cultural sector, metadata has vast significance to scientific research. Edwards describes extensive, highly structured data as ‘a holy grail, a magic chalice” that can make data integration and sharing seamless (Edwards 672). Not only does this make datasets easily transferrable between researchers and communities but it also enables transferability between systems. This is essential to the preservation of digital material. Without proper standardised, monitored and extensive data we run the risk of losing the digital data we’ve created. Despite the perception of technological infallibility decay can erode our digital present as it has our analogue past. Therefore, good structured metadata not only allows for efficient and expedient workflow but helps to preserve online resources which can be utilised in years to come. Corti, Louise et al., “Managing and Sharing Data” UK Data Archive. Web. http://www.data-archive.ac.uk/media/2894/managingsharing.pdf. 25 October 2016. Edwards, Paul N. et al. “Science Friction: Data, Metadata, and Collaboration.” Social Studies of Science, 41: 5 (2011): 667–690. Web. http://www.jstor.org/stable/41301955. 25 October 2016. Linkert, Melissa et al. “Metadata Matters: Access to Image Data in the Real World.” The Journal of Cell Biology, 189.5 (2010): 777–782. Web. http://www.jstor.org/stable/27811023, 25 October 2016. Park, Jung-ran et al. “From Metadata Creation to Metadata Quality Control: Continuing Education Needs Among Cataloging and Metadata Professionals.” Journal of Education for Library and Information Science, 51.3 (2010): 158–176. Web. http://www.jstor.org/stable/40732596, 25 October 2016. Rabinowitz, Alan, ‘It’s about time: historical periodization and Linked Ancient World Data’ Institute for the Study of the Ancient World. Web. http://dlib.nyu.edu/awdl/isaw/isaw-papers/7/rabinowitz/, 25 October 2016. Riley, Jenn, and Kelcy Shepherd. “A Brave New World: Archivists and Shareable Descriptive Metadata.” The American Archivist, 72.1 (2009): 91–112. Web. http://www.jstor.org/stable/40294597, 25 October 2016. When indexing a photographic collection the archivist must decide how to catalogue the relevant subject. Essentially, a human being must look at, interpret and describe the object before them so that a user may locate them within the repository. While this may seem a relatively simple task it is important to consider the challenge this imposes; when a picture is worth a thousand words which words do you choose? This post will seek to examine the difficulties that arise out of the necessary indexing and categorisation of photographs within digital repositories. When examining photographs within an archival institution the process can be somewhat arduous or relatively simple. Photographs could be catalogued individually, each with associated keywords and descriptions in an online or analogue catalogue, sometimes both. Alternatively, a large bundle of photographs could be put under a somewhat broad title, “Irish Revolution 1916-1922” for example, and the user must examine each photograph separately to see which ones are relative and which are not. Either way the user is prompted to analyse each catalogue entry or each photograph. However, with a digital repository different criteria come into play. Researchers are prompted to enter dates and keywords associated with the image. As demonstrated by Murtha Baca the definitive labelling of a photograph is far from simple, when “pre-Colombian” is synonymous with “pre-Conquest” how does an indexer define a photograph. (Baca 10). According to Marcia Bates “ideally, the challenge for the indexer is to try to anticipate what terms people with information gaps of various descriptions might search for.” (Bates) Where this is successfully accomplished a researcher can locate a relevant image within seconds. The issue occurs when it isn’t. When users are not prompted to search line by line, to scour repository search terms the same way we do catalogues, does valuable information fall between the cracks? And if it does, does digitisation do the researcher more harm than good? The creation of an online repository establishes a certain amount of trust between user and product, if a search returns no results is it unfair to assume it was never there rather than hiding? Another fear generated by modern technology is our decreasing ability to analyse. When the goal is information and information is provided a plenty do we care where it comes from? While photographs are open to interpretation and therefore difficult to distort there is a way in which digitisation limits their scope. The most obvious way is through formatting and presentation. As Elizabeth Edwards argues the copying, mounting, standardising and indexing of photographs in the Cambridge Project removes the photograph from its original context. Her examination of materiality reflects on the importance of this context to the meaning and interpretation of a photograph, without it, she argues, “reinforces the taxonomic readings of the images, creating a cohesive anthropological object rather than a series of images with their own semiotic energies.” (Edwards 71). Essentially, does a standardized format distort the interpretation of a photograph which was previously treasured in an ornate frame or tattered photo album? Arguably, the answer is yes. Context is not a discardable detail but a fragment of the puzzle which artefacts seek to decipher. Similarly, when a photograph is limited to certain tags do we limit its potential? If a user is informed that a photograph or artwork belongs to a certain theme do we already limit their ability to interpret as it has been done for them? Why should a user critically analyse the meaning of a photograph when the database has done it for them? In conclusion, online repositories can provide a wealth of information in a matter of seconds. Users can obtain access to resources they may never have seen otherwise. However, what of the challenges they don’t see or the questions they don’t know to ask? How do we prevent resources from falling through the metadata cracks? Additionally, in creating this metadata how do we guide a user to a resource without impacting their interpretation before they’ve seen it? Baca, Murtha, “A Picture Is Worth a Thousand Words: Metadata for Art Objects and Their Visual Surrogates” http://www.columbia.edu/cu/libraries/inside/units/bibcontrol/osmc/MBaca.pdf. Web. 17 October 2016. Bates, Marcia, “Indexing and access for Digital Libraries and the Internet: Human, Database, and Domain Factors” https://pages.gseis.ucla.edu/faculty/bates/articles/indexdlib.html Web. 17 October 2016. Edwards, Elizabeth, “Material beings: objecthood and ethnographic photographs” Visual Studies 17:1 (2002): 1-19. Web. 17 October 2016.